New for the 2012–2013 school year, The New Century School provides a gymnasium for physical education! In keeping with TNCS’s progressive, forward-thinking style, though, this gym is no ordinary gym. The Lingo Leap (TLL), as it is now known officially, integrates physical exercise with cognitive development—moving and learning! TLL’s philosophy is that brains work more efficiently when the body is also engaged, and there’s plenty of hard science to back up this notion. In fact, neuroimaging shows that during movement, more brain areas are lit up, meaning that more of the brain is active and in use. Why not take advantage of this “powered-up” state and give the brain something to do with its extra energy? Let’s face it—one of the most challenging tasks we can give our hungry brains is learning a new language. So, TLL focuses on multiple language acquisition; currently, yoga, dance, and other movement classes are being offered for ages 2 and up (including for interested parents) in your choice of English, French, or Spanish with plans to add classes in Mandarin and Arabic soon. TNCS students, by the way, get regular phys ed at the gym in Spanish. TLL Director Amy Pothong says that “when [students] are totally immersed, they speak like natives.” Although this idea might sound revolutionary, it’s actually “getting back to the basics.” “As we get older,” says Pothong, we must get more socially standardized, which can hinder our natural ability to learn through movement.” Babies, she points out, largely communicate through gestures, which are a very basic form of movement and hearken back to the earliest human communication by our ancient ancestors. The connection, then, between bodily movement and thought conveyance is well established in our being. Two main schools of thought have emerged to explore how we can optimize this connection to actually learn to communicate better (or at least in more than one language). First was Total Physical Response (TPR), developed in the mid-1960s by Dr. James Asher as a method of learning a second language. Asher noted that the conventional approach to learning second languages differed dramatically from how infants learn their first language. Infants learn to communicate by internalizing language, a process of protracted listening and absorbing. TPR is a technique that replicates that process for learning second languages and beyond by giving a command, modeling the action described in the command, and then having the student imitate that action. Students are not initially asked to speak, but to comprehend and obey the command. Understanding is at the root of language acquisition, according to Asher. This makes a lot of sense when you consider how babies learn to respond to increasingly complex utterances before ever verbalizing a thought. Language acquisition expert Stephen Krashen has found this method very effective. Read his article on TPR here. He says, “A constraint on all activities that we might consider is that they be interesting for both the teacher and the students; it is difficult to fake enthusiasm.” Enter TLL with engaging movement classes for kids plus their parents! About that physical training, TLL features state-of-the-art Gerstung gym equipment that “[encourages] children to use their own innate curiosity to stimulate movement. Created by Siegfried Gerstung, a world-renowned educator, Gerstung equipment is not only customizable and moveable to provide “movement education” in three dimensions, but the Gerstung company is locally owned, with that commitment to community shared by TNCS and TLL. Registering for classes is a snap on TLL website–make the jump to polylingualism! On October 31, 2012, The New Century School decided to come clean. As part of an ongoing sustainability plan, TNCS switched off fossil fuel–derived energy and turned on with the environmental-friendly, clean energy provided by Clean Currents. 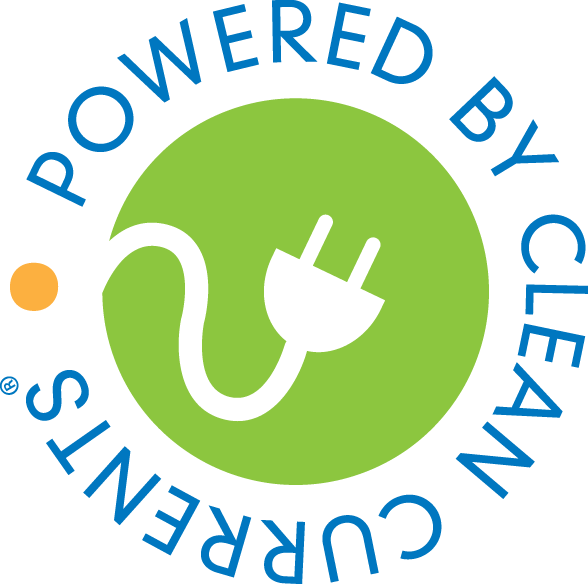 Clean Currents delivers 100% wind- and solar-powered energy, a service that benefits the school; the environment; and, some say, the U.S. economy. TNCS gets greener every day! TNCS is fortunate to be located in Maryland, one of a handful of states (see map) currently enjoying a deregulated energy market for both electricity and gas (most states have deregulated one or the other or are not yet deregulated). This means that although Baltimore Gas & Electric owns and maintains the power lines, Clean Currents’ wind energy is what’s coming through those lines to power the school. In other words, consumers can choose not only who provides their power, but also have a choice in what type of power they buy, thanks to companies like Clean Currents. With choices come advantages. 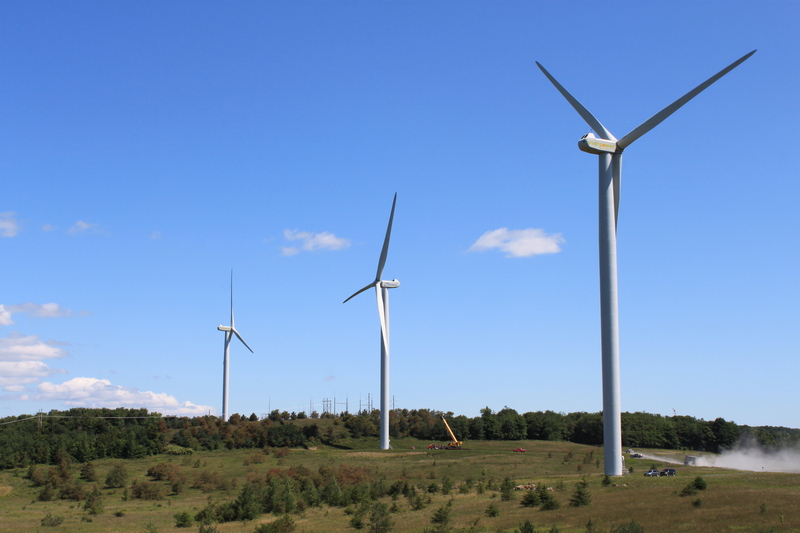 The most obvious benefit to wind energy is its environmental friendliness. “Windustry” ameliorates climate change by not only providing a non-polluting source of energy but also by displacing the greenhouse gas emissions that have already polluted the atmosphere from conventional power. But there are other tremendous advantages, too. By reducing our dependence on fossil fuels, for instance, clean energy also makes us less vulnerable as a nation to the vagaries of the international oil market . . . and to the associated security risks. Moreover, ever-renewable wind is a cash cow for farmers. Wind farming almost effortlessly generates considerable income without taking up land needed for crops as well as creating jobs and boosting the economy. So, as President Obama has pledged to move the United States toward energy independence, TNCS is doing their part to get there at the community level. Clean Currents was a natural choice for collaboration. Being a “benefit corporation, we have elected to build in commitment to the local communities we serve along with the environment. It’s part of our operating agreement,” says Emily Conrad, Community Outreach Coordinator for Clean Currents. And TNCS likes a company that is motivated as much by doing lasting good for its community as by its bottom line. The benefits to the school itself are also numerous. Besides going green, TNCS will host Clean Currents workshops with students that will focus on “age-appropriate activities around the world of energy,” says Conrad. This is another way that TNCS can reinforce to students the importance of respecting our world. It’s beautiful, and I think it’s what I want to be . . .
P.S. Stay tuned to learn about the upcoming Green Neighborhood Challenge that will bring green energy to your door. That’s right—TNCS and Clean Currents are partnering to expand clean energy availability to the surrounding community. Look for a post about the Green Neighborhood Challenge in early 2013! 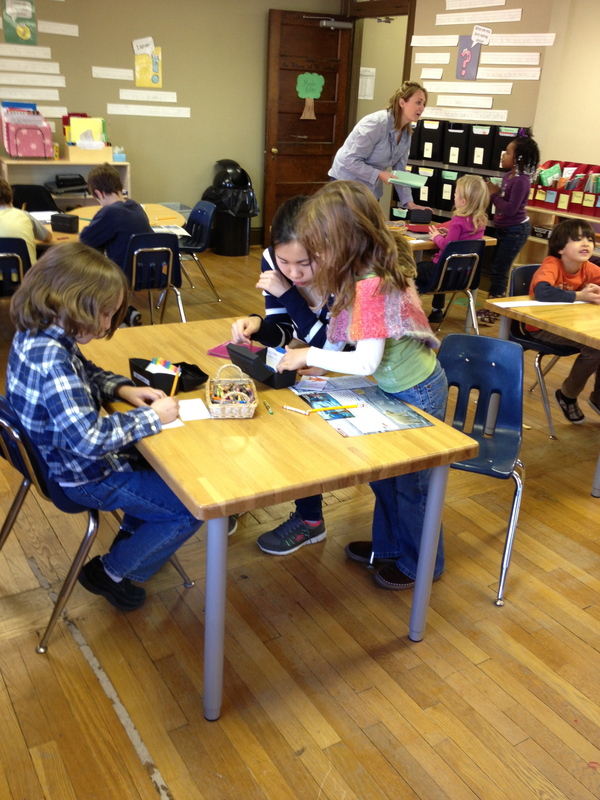 The New Century School believes fervently in instilling core values in children as a key part of their education. Life skills are equally, if not more important, than cognitive skills in developing the whole person. Such skills include self-discipline and self-esteem, among others, which enable us to surmount challenges. “[TNCS students] welcome a challenge, and they do the work that’s required to meet that challenge. They are willing to take risks because they understand that often the most valuable learning comes when you try, fall, get up, and try again,” affirm school founders Roberta Faux and Jennifer Lawner. Education author and speaker Paul Tough might well approve of this approach. 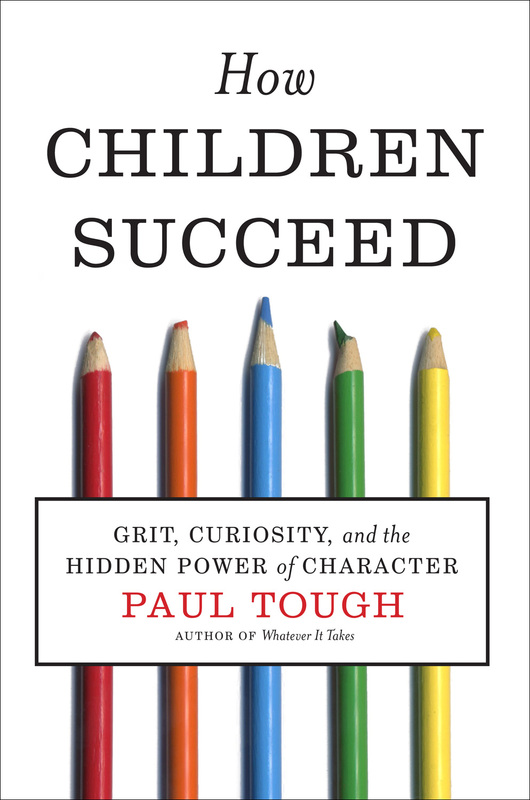 Tough’s second book, How Children Succeed: Grit, Curiosity, and the Hidden Power of Character, explores the seeming paradox that helping kids learn how to fail can ultimately teach them how to succeed—and not just on standardized tests. So, as Superstorm Sandy raged outside on the evening of October 29, 2012, an intrepid group braved the elements to gather at the Patterson Park Public Charter School‘s cafeteria on East Baltimore Street to hear Tough speak. Building on accumulating evidence that children exposed to “toxic stress” experience lifelong debilitating emotional and neurologic effects (see Harvard University’s “Toxic Stress Derails Healthy Development” for more information), Tough also writes about what happens when stress is a positive influence. He explains that adversity in small doses and the subsequent soothing that comes from nurturing environments is a critical part of development in infancy. A crying baby who is soothed by a caregiver is not only learning an important dynamic but is also establishing appropriate neurochemical pathways. Such seemingly mundane interactions set off a veritable fireworks display of synapsing neurons in the infant brain. Students learn, in other words, just that “stick-to-it-iveness,” that grit, that Tough calls one of the most important noncognitive skills, or “character strengths,” along with curiosity, optimism, zest, social intelligence, gratitude, and self-control. These seven key character strengths have been a part of TNCS’s mission all along. By learning to manage their failures (to “tough it out,” so to speak), TNCS students are, conversely, honing the tools they need for a life fulfilling, meaningful, and happy. Wondering about your own level of grittiness? Take the Grit Test here! 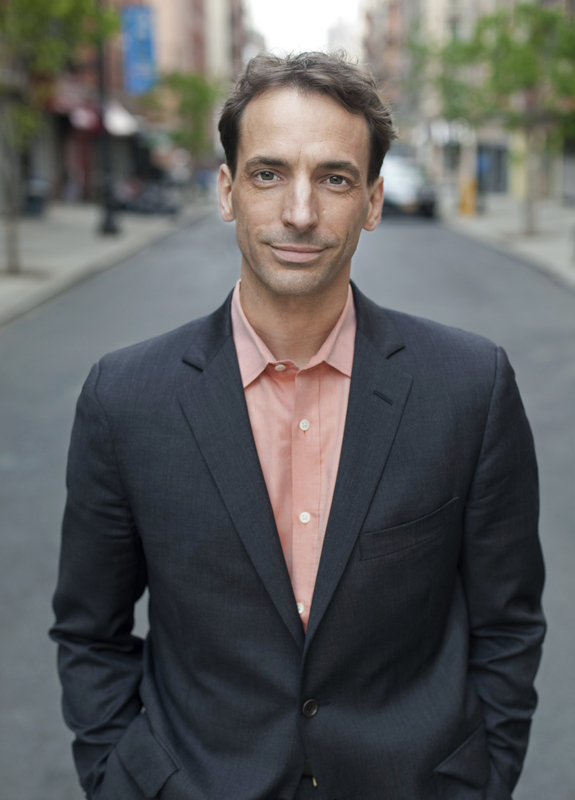 Read Paul Tough’s in-depth account of character education in the New York Times Magazine here and more on toxic stress in The New Yorker here. Listen to Tough’s Back to School interview with Ira Glass on This American Life here. Part 2 of The New Century School interview with Chef Emma Novashinski concerns expanding awareness of what’s in our food—“cleaning the ingredients,” as she puts it. Read on . . .
TNCS: Can you talk more about the ethos behind the Garden Tuck Shop program? Chef Emma: I really want people to know why, as in, “Why can’t [my child] have more of the things he likes on the plate? He can’t because that’s not how the program works in order to get your child a balanced meal. But it’s not just about nutrition or even food cost; it’s also about responsible portioning. The child cannot make the best decisions—that’s our job. [The program] is definitely the best decision you can make and take back some of the control over what your child eats. We say to the picky eaters, “Do with it what you will but know there’s no extras. If you’re hungry, try something else on the plate.” There’s so many different levels that this teaches them. TNCS: How is the program going in its second year as compared to last year? TNCS: [In Part 1] you mentioned that your son participates in the program. How big of a role did he play in the development of the program? Chef Emma: Well, I had cleaned up my own food source pretty quickly after moving here, but then I had Quin, and he had to go to school. But the quality of the food in public school wasn’t acceptable to me. I also realized that just his exposure to what other kids were eating and the peer pressure would have an impact in what he chose to eat, and I couldn’t really comfortably allow him to be around it. Next I realized that not everybody has a choice. 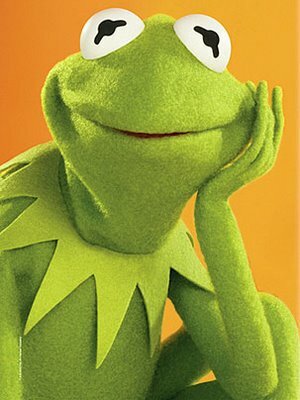 I thought to myself, “How can I clean his food sources, clean other kids’ food sources, and expand that to my community”? And that’s when I walked three blocks from my house [to the school] and saw them putting up a greenhouse. So, I offered to do the gardening, install the plants in the greenhouse, and then developed the program from there. TNCS: Can you elaborate on what “clean your food source” means? Chef Emma: Cleaning food means choosing pantry items that don’t have additives or preservatives or genetically modified ingredients. Walmart, for example, sells GM food. People think its easy to go there and pick up essentials or do the weekly shop, but are they aware that the food source could be full of poison to extend shelf life? It can be very hard for people to see how to change. They might say, “I have to buy organic,” but there’s lots of things you can change without having to do that. All you have to do is literally “clean” your ingredients by using what’s in season, what’s locally available. This is where people can become defensive. I don’t want people to overhaul their lives. Because it’s easy to stand on a pedestal and say, “You should be doing this or you should be doing that,” but that’s not what anybody should be doing—they just need to know what’s in the products. And then, because of that, it would make more sense to do more cooking at home. TNCS: So, using all organic foods isn’t necessarily a prerequisite for cleaning up our food sources? Chef Emma: I wouldn’t say I’m all organic, and I don’t think there’s any point being organic if you’re still going to have a carbon footprint and ship your stuff over from Chile or California. The idea is that it’s natural. If you’re going to cook at home, for example, you would use more natural ingredients and not allow toxins to creep unseen into every aspect of life. The program is vegetarian, however, because it’s logistically easier; if I was going to do meat, I would have to have a local source. TNCS: It sounds as if this program might expand awareness back at home, too. What does this mean for parents? Chef Emma: The parents have an opportunity to be involved because with a commercial kitchen and a greenhouse we can offer parents better options for ingredients. They don’t have to change anything they’re doing or cooking except that this way they can “clean” the ingredients they would use. There’s a practical level for at home. The program is multifaceted. On one level your children have access to an all-natural, seasonal meal that has been home-cooked everyday. On another level, they have access to a growing space where they can recapture the relationship to food source. 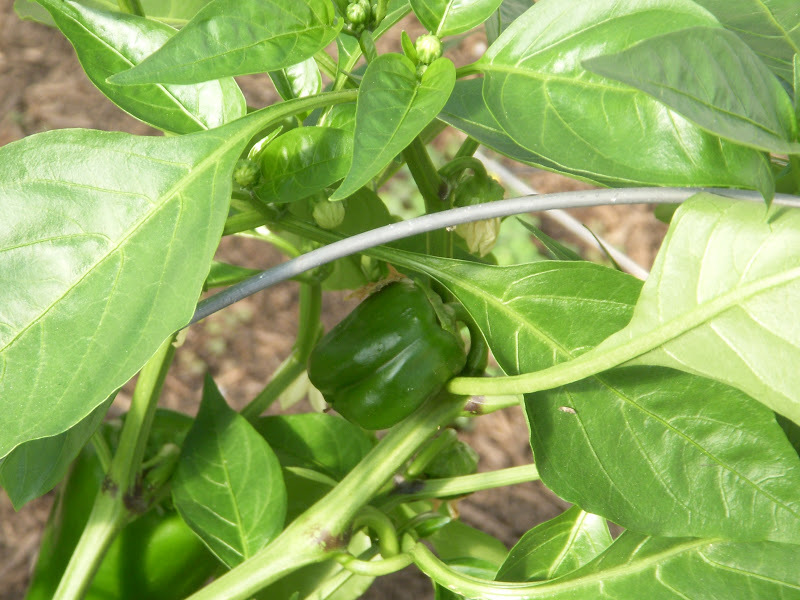 On another level there’s the educational benefit of learning what is in season by going into the greenhouse and having the practical experience of looking after the garden and even learning the science behind how plants work. From there you get yet another level because the children become more interested in wanting to cook food themselves. Next, you start to reintegrate family meals and cooking at home. Then another level would be providing the resources so that you don’t have to change what you prepare at home, but you can make better choices about the ingredients themselves. So, it starts to feed into the home that way. Kids will already be educated, speak the language of clean food. They will already want to make better choices for themselves. TNCS: When you say “providing the resources,” did you literally mean come pick stuff out of the greenhouse or were you referring to educational resources? Chef Emma: Both. First, Home Ec [or an equivalent] should be there; academia has overlooked the fact that you can eliminate so many [health] problems, like ADHD and allergies [evidence also exists for dyslexia, dyspraxia, and possibly some features of autism], with a clean diet. So that should be the first learning tool we teach kids. You can’t make good decisions if you’re fighting sugar or you’re run down. Second, parents can have access to the whole thing—come get herbs! Fresh herbs for the taking . . .
TNCS: So, let’s get to the nitty gritty of why the program is so important. How will eating fresh food that’s in season improve overall health and wellness as well as our children’s cognitive function? Chef Emma: Bringing [this kind of education] back is important. People aren’t learning to cook; they’re not learning to garden. And that’s further creating this dischord between people and nature. We don’t even know the properties of our food. That’s crazy to me. Our food—our fuel—is the most important decision we can make to have wellness. People forget about that. They don’t associate food as a fuel. TNCS: And finally, what’s your favorite food? Chef Emma: Oh gosh, I just want to say bacon! I think I would have been a vegan spiritual guru if it wasn’t for pork.
. . . A perfectly lighthearted ending to some “heavy” ideas! 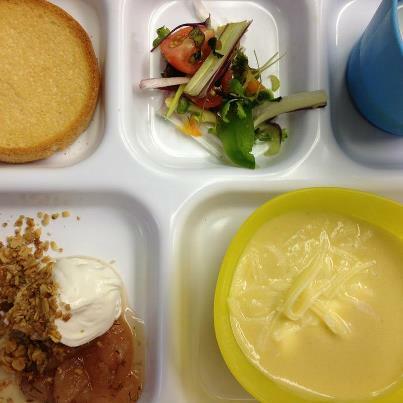 School lunch, as Chef Emma mentioned, can be a contentious issue, and it’s certainly a divisive one in this country, as one ABC news story shows. Not everyone has ready access to homemade, locally sourced food for one thing. Remember the 1980s when President Ronald Reagan tried to classify ketchup as a vegetable because it was cheaper than, say, peas or green beans to put in school lunches? Amidst current First Lady Michelle Obama’s 2010 efforts to refurbish the school lunch tray with a nutritious meal rather than an assorted array of bulk food bargains chock full of additives and preservatives, politicians are still trying to stretch the definition of vegetable and stymie her laudable endeavors. But pizza?! Come on. That’s not to say that pizza doesn’t have a well-earned place on the plate, but it should be disqualified as a vegetable on several grounds, including saturated fat content, the fact that there’s no such thing as a pizza plant or tree, and that no kid has ever refused to eat it. (Unless it’s topped with veggies.) Oh yeah, and there’s also the fact that if its tomato component is what supposedly qualifies it as a vegetable, well, tomato is a fruit. Maybe lobbyists should be trying to classify pizza as a fruit? Though TNCS students are especially fortunate to have Chef Emma’s Garden Tuck Shop program, things are actually looking up for school lunches at the national level, too, with Farm-to-School and Fresh Fruit and Vegetable initiatives by the U.S. Department of Agriculture’s Food and Nutrition Service because obesity and associated chronic illness rates are making the necessity of good nutrition impossible to ignore. Scientists have known for several years that consuming foods high in antioxidants—that is, fruits and vegetables—neutralizes the damaging effects of free radicals at the cellular level and even promotes neurogenesis in aging brains (see “Nutrition and Brain Function”). The darker the fruit (think blueberries), the more synapses sprouted! What about for kids? Few studies exist on nutrition in the post infancy period of healthy kids, but they show that healthy eating promotes healthy functioning of all the organ systems, including the central nervous system, and wards off chronic illness. Micronutrients including iodine, iron, folate, zinc, vitamin B12, and omega-3 polyunsaturated fatty acids are all important for brain development in school-age children, and many such micronutrients rely on the interactions with other foods for absorption such as zinc and vitamin A. In other words, getting them from a balanced diet yields far superior benefits in verbal learning and memory than what can be derived from dietary supplements. It’s also true that better health fosters better performance in school, according to many studies. Taken together, good nutrition –> health –> cognitive function. And Chef Emma was right that it all goes hand in hand: a recent Canadian study shows that young kids who cook or participate in the kitchen tend to independently choose healthier foods than do their non-cooking counterparts. Eating healthy at school reverberates at home and wherever your kids are faced with food choices. It’s an easy win. Emma Novashinski is an engaging and eloquent person to talk to . . . and she’s passionate about food. 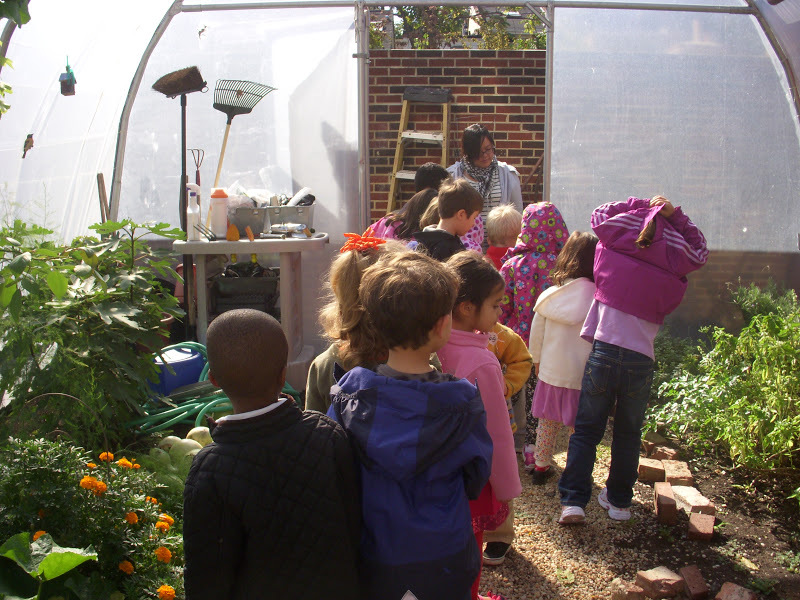 In fact, she’s so passionate about food and where it comes from, that when she saw a greenhouse going up on TNCS grounds, she walked over and asked if she could run the greenhouse as well as develop a school lunch program out of it. In Part 1 of this interview, she provided background on the program and shared some of her very relevant personal history. TNCS: Where are you from, and how did you become interested in gardening and cooking? 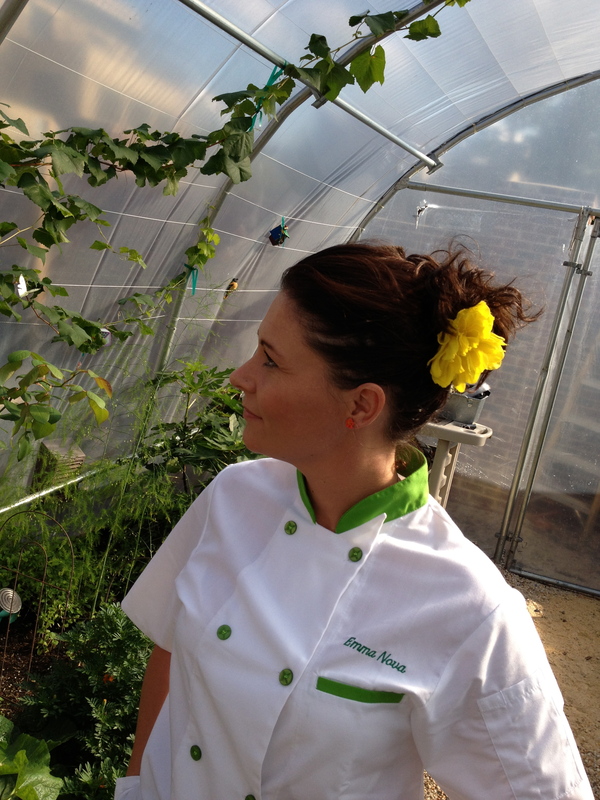 Chef Emma: I moved here in 2006 from Guildford, Surrey in southeast England. My mum loved gardening—she was always outside when she wasn’t working—and I helped her out from the beginning. I must have loved it, too, though, because I know from experience that just exposing a child to something doesn’t always mean he or she will take to it. 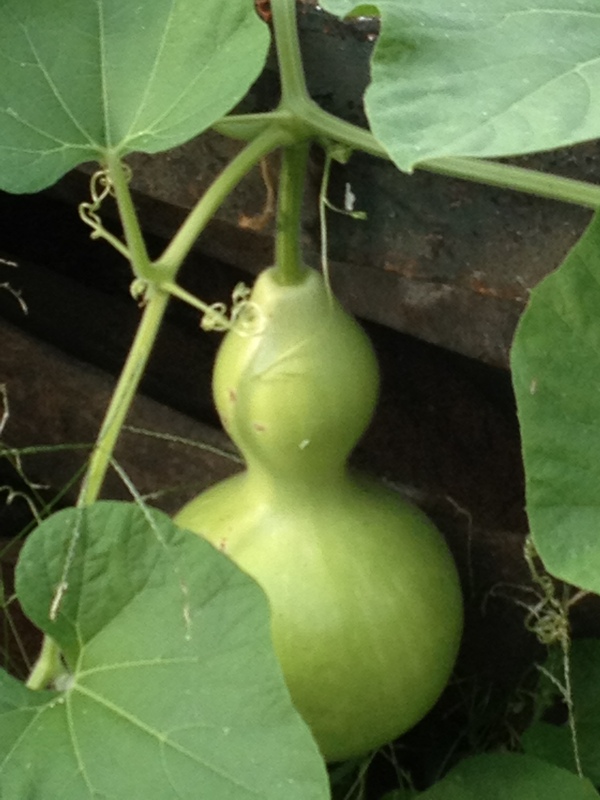 But for me, her love for the garden and cooking definitely had a huge impact. TNCS: In what ways did you help your mother growing up? Chef Emma: She would give my brother and me each a bowl when we would go out to play, and we had to find something edible along the way, like blackberries or raspberries. She was teaching us to identify edible things in nature from early on. Wherever we went, whatever we were doing, she would always find something off the land that we would end up eating, usually herbs and fruits. And then we would go home and cook! She also believed in homeopathy, so we used home remedies and aromatherapy. We even cleaned the house using natural ingredients like lemon juice, bicarbonate, and vinegar. TNCS: Was it difficult to transition this way of living to Baltimore? Chef Emma: Fortunately, Baltimore is in a similar climate zone to England and has similar plants so it was handy to come here because I am familiar with what these seasons have to offer. I always knew where to go blackberry picking and where the best apple trees were. And around here, there are even a few fig trees growing in front of shops. The shop-owners will call to let me know when the figs are out during fig season, and I can go pick as many as like. That’s what happens—you get talking to people and they’ll tell you that there’s a mulberry bush growing in the park or that there’s catnip growing in the market roundabout, and you find out about these things that are just growing around. That’s my thing; that’s how I grew up, identifying things and knowing what’s in season and taking advantage of it–because that’s when it tastes best! TNCS: Do you find that how you grew up, living in sync with the seasons, is unusual in some way? Chef Emma: No one seems to grow up like that anymore. It’s in your blood, but it’s definitely something very new, a very revolutionary way of looking at food because it’s the most natural way. When I first came here from England, I noticed almost immediately that there was a lot of modified food–chemicals, additives, preservatives in the food that we don’t have in England. Even in the candy—it’s illegal to modify candy in England; it’s vegetarian. No animal byproducts. So, I noticed almost straightaway that I developed allergies, felt sluggish, began to put on weight . . . and it’s because the connection to nature, to our food source, to our most important part of wellness has been severed. TNCS: Why do you think that the connection to our food sources was severed? How did that start? Chef Emma: There has been a conscious decision to sever that connection. I think that the food industry and the health industry go hand in hand and together generate so much money that they have lost touch very deeply. Food has been totally commercialized here. You can ask a child, “Where do strawberries come from?” And they’ll say, “the [supermarket].” There’s a disconnect there. TNCS: The Big Question: How will the Garden Tuck Shop Program change that for TNCS students? 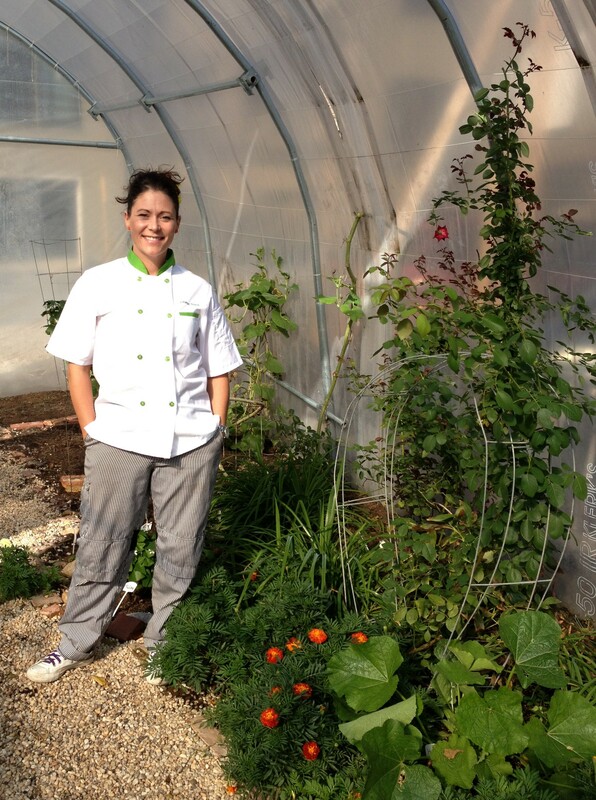 Chef Emma: The greenhouse on TNCS school grounds is intended to reconnect the students to where food actually comes from. Every class is going to start being in the greenhouse every day for half an hour. The plants that are in there now are perennial so they’re going to come back every year. We’ve got figs, brambles, berries, asparagus, rhubarb, grapevines, and more so the students are going to be able to see these plants go through the whole of their process and reemerge next year; we call it “slow food.” We can still do carrots and things in the spring to keep their hands in the dirt, as it were, but from now on I want to hand the greenhouse back to them so that they can see every stage from seeding to harvesting and, finally, to eating. That’s why the program is called the “Tuck Shop.” A tuck shop is a place to eat—like “tuck in” to a meal—and instead of having soda and candy machines in the school, which is again, commercialized, give them a tuck shop where clean food is available. TNCS: Can you describe the menu? 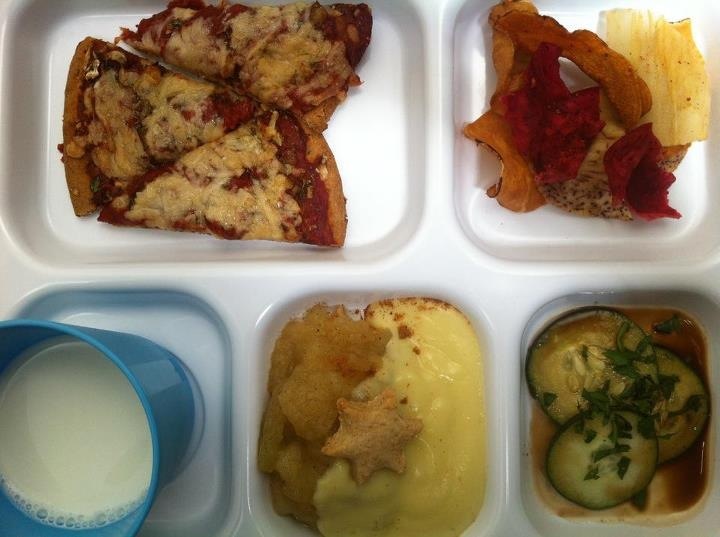 Yes, this is a Garden Tuck Shop school lunch! Chef Emma: My son has been on the program from Day 1. He’s my nemesis; if I can get him to eat it, I know it’s good. I had to develop a menu for kids that wasn’t going to challenge them too much. We’ve got about 50 items, and I think I can comfortably say that at least 50% of the meals get eaten and they’re all nutritionally sound. I’m trying to make it as generic as possible and making it repeatedly and consistently the same so TNCS students can start to identify and recognize the food. The teacher has a menu on hand, and I don’t deviate from that—unless the produce is bad. For example, we got some bad peaches, but right now there’s lots of apples and watermelon, so it’s “1,001 Ways to Cut an Apple”—apple crumble, apple pie, apple streudel, applesauce, apple butter . . .
TNCS: What do you want parents to take away from this? Chef Emma: You grow in the same environment as your food, so you have a divine connection. Your children and your plants are growing under the same sun and being touched by the same wind, seeing the same clouds and the same moon. 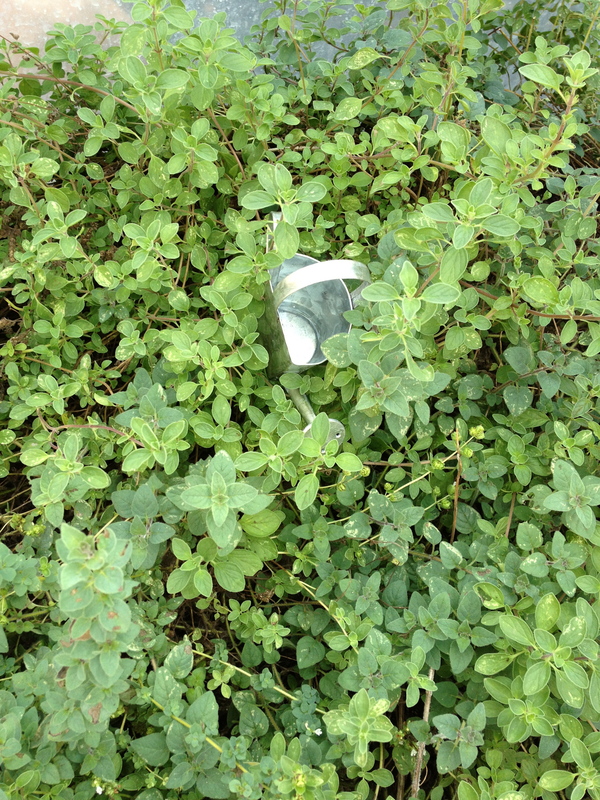 The plants growing in your environment have withstood those particular elements. They are perfectly engineered by nature to be exactly what you physically need, right now. A lot of people spend their lives looking for something they feel is missing, and I wouldn’t be surprised if the majority of that feeling disappeared if people had that connection with their food source.